A quinzhee or quinzee /ˈkwɪnziː/ is a Canadian snow shelter that is made from a large pile of loose snow which is shaped then hollowed. This is in contrast to an igloo, which is built up from blocks of hard snow, and a snow cave, constructed by digging into the snow. The word is of Athabaskan origin, and entered the English language by 1984. A quinzhee can be made for winter camping and survival purposes or for fun. A similar but more elaborate snow-house is called a lumitalo. Quinzhees typically have an inside height after excavation which allows for sitting or crouching but not standing. The snow for a quinzhee need not be of the same quality as required for an igloo. 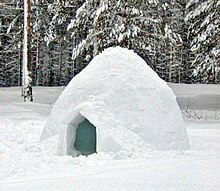 Quinzhees are not usually meant as a form of permanent shelter, while igloos can be used for seasonal habitation. 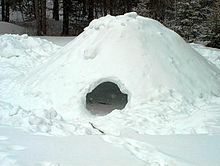 The construction of a quinzhee is much easier than the construction of an igloo, although the overall result is somewhat less sturdy and more prone to collapsing in harsh weather conditions. Quinzhees are normally constructed in times of necessity, usually as an instrument of survival, so aesthetic and long-term dwelling considerations are normally exchanged for economy of time and materials. Excavation may be accomplished more quickly if large blocks of interior snow are carved and slid out through a large, temporary "excavation door". Strength increases when all interior wall and ceiling surfaces follow an arched curve, with no flat sections. Once excavation is complete the excavation door can be permanently blocked using previously excavated blocks, and a smaller permanent door can be cut in the most desirable spot. Time and effort are required to hollow out the center of a Quinzhee, though these can be reduced by piling snow around a hollow structure, such as a pile of packs or a makeshift tent or dome. Allowing the interior temperature to rise above freezing point risks weakening the shelter significantly, especially if the outside air temperature is near freezing. A small hole for air circulation should be poked through the ceiling. To avoid dripping melt-water, irregular or bumpy surfaces are often smoothed to direct the flow of water down the walls to gather around the edges. A non-airtight fabric door cover will minimize the amount of cold air coming into the quinzhee. An empty, well built snow structure, 16 or more hours old, in weather below −12 °C (10 °F) may be strong enough to support a group of adults standing on top of it. All snow shelters eventually collapse or melt. Quinzhees can collapse from poor snow conditions, warm weather, blowing rain, construction problems (hitting a supporting wall), failure to let the snow sinter long enough, or from people climbing on them. Collapse poses a danger of suffocation for occupants. Quinzhees should not be used when temperatures are warmer than −4 °C (25 °F) due to risk of collapse. The greatest risk of collapse occurs during the excavation process. Longer sintering time generally reduces risk of excavation collapse. To reduce undue loading on the roof of the quinzhee, the interior ceiling should be excavated first, then the interior walls and floor. One person should be outside the quinzhee while another is digging inside. Place a shovel, branch, hiking pole, or such near the head of a sleeping person for roof support, to break a falling roof to create an air gap, and/or as a tool to dig out. One shovel should be left outside to mark the door and aid rescuers in digging occupants out. Some users prefer a marker to be left outside the quinzhee nearest the heads of sleeping occupants to indicate where rescuers should start digging. A lumitalo is a more elaborate snow-house or building made out of snow in a manner similar to a quinzhee. The term is Finnish in origin. The city of Houghton, Michigan, builds a lumitalo as part of its annual Winter Carnival held by Michigan Technological University. Halfpenny, James C. & Roy Ozanne (1989). Winter: An Ecological Handbook. Boulder, CO: Johnson Books. pp. 230–234. ^ Allen & Mike's Really Cool Backcountry Ski Book: Traveling and Camping Skills for a Winter Environment, Allen O'Bannon, illustrations by Mike McClelland, Chockstone Press, 1996, ISBN 1-57540-076-6, pg. 80-86. ^ Streever, Bill (2009). Cold: Adventures in the World's Frozen Places. New York: Little, Brown and Company. p. 187. ISBN 978-0-316-04291-8. ^ "Does English still borrow words from other languages?". BBC News Online. 3 February 2014. Retrieved 2014-02-05. Some examples that the Oxford English Dictionary suggests entered English during the past 30 years include tarka dal, a creamy Indian lentil dish (1984, from Hindi), quinzhee, a type of snow shelter (1984, from Slave or another language of the Pacific Coast of North America), popiah, a type of Singaporean or Malaysian spring roll (1986, from Malay), izakaya, a type of Japanese bar serving food (1987), affogato, an Italian dessert made of ice cream and coffee (1992). ^ Lumitalo and other Heikinpäivä events Archived July 18, 2011, at the Wayback Machine. Keweenaw Peninsula. February 8, 2002. ^ Houghton's Snow House Archived January 6, 2009, at the Wayback Machine. Keweenaw Peninsula. February 8, 2002. How to build a Quinzhee. Video.